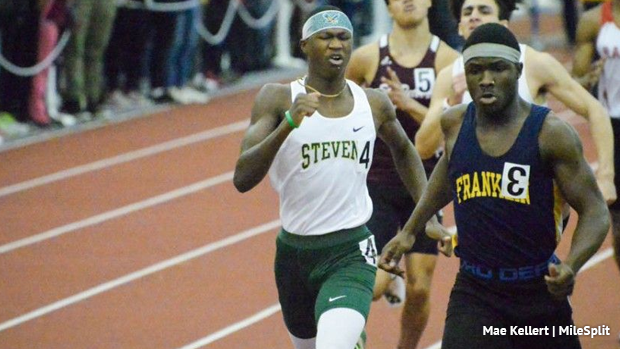 Here are the boys MileSplit New Jersey All-State teams for the 2018 indoor track and field season. These were chosen with consideration to the full season of work, head to head match-ups, as well as emphasis on titles won. We will also being opening these teams up individually to all New Jersey high school athletes: NJSIAA, prep, and club. For the first through third teams an athlete will be listed once for their best event, freshmen who make the first three teams will still be listed as part of the freshmen team. Groups and Sectionals Results and Coverage - Over 1,000 Videos Posted! Gabriel Nash ended Mario Heslop's attempt at three Meet of Champions golds in one meet with an exciting victory in the 55 dash. Nash posted a PR of 6.42 which holds up for NJ#3 on the season and he'll be back again in 2019 to try and defend his title. Talk about hard work paying off. Last year Sincere Rhea had a PR of 7.70, he lowered that by .35 this season winning the Meet of Champions with a time of 7.35. The St. Augustine Prep junior is the only athlete from the MOCs finals returning for 2019. 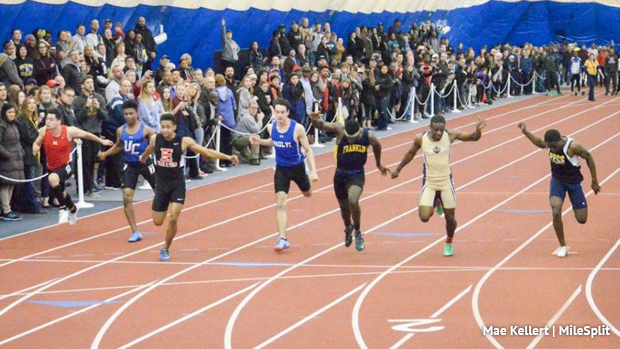 Isaiah Greene was second at MOCs, second at Eastern States, and won the Group 2 state title, his PR a 7.32. 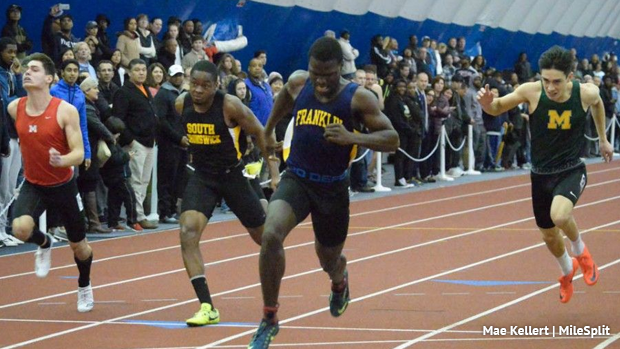 Akeem Lindo went under 7.40 at four meets this season including his US#9 state leading 7.31 to win the Group 4 state title. 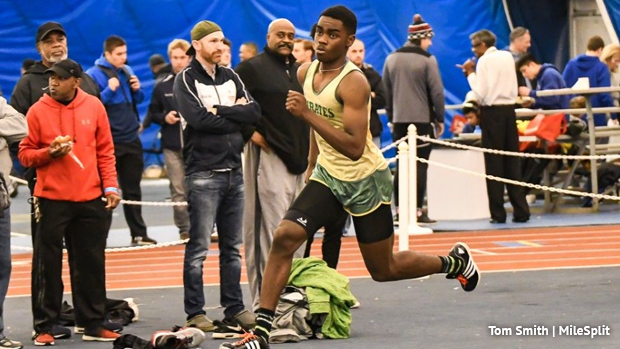 Brandon Greene represents the freshmen team for the hurdles, he led all freshmen this season with a time of 8.37 as well as during the NJSIAA meets with his 8.79 from sectionals. 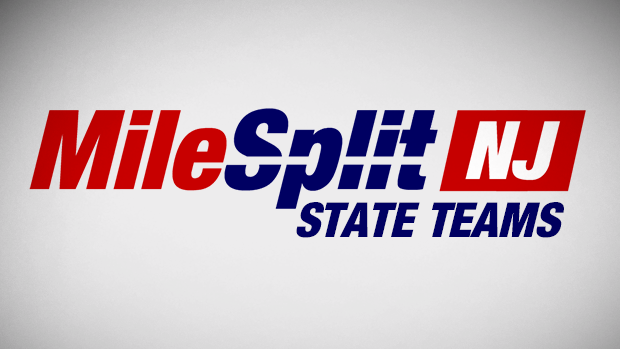 Mario Heslop could have found himself leading a few different sprint events on this state team. This season he tied the state record in the 55m dash running 6.26 during Eastern States, that same meet he destroyed the 200m state record with a time of 21.09. At the Meet of Champions Heslop won the 400m, 200m, and finished second in the 55m dash. He finished his season fifth in both the 55m and 200m at New Balance Nationals Indoor. All that and he still returns next year for more. Nadale Buntin won the GMC Championships and was second at Groups and the Meet of Champions only to Mario Heslop. Buntin lowered his PR to 48.98 this winter, a time that came at the Bubble during MOCs. Parisi and Bagley traded wins and head to head match-ups all through February, both having strong state seasons. Luis Peralta leads this event as a junior with his Meet of Champions win and a great third place finish at Nationals out of the slower morning sections running 1:51.74 US#5. Damien Dilcher won the Shore Conference, his Sectional, and the Group 3 title finishing up third at the Meet of Champions. 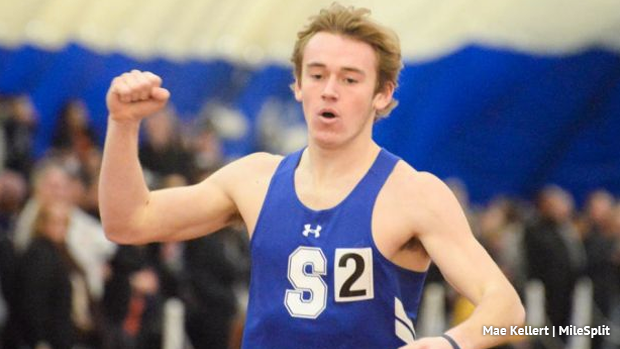 Sean Dolan's monster 1:51.77 US#5 run for All-American status at New Balance Nationals Indoor was just too much to leave off this team. With that said Atharv Kulkarni of West Windsor Plainsboro North deserves a nod for his solid state season as well in this recap, second at the Meet of Champions. Julian Jensen-Lim of McNair Academic placed fourth for Group 1 running 2:02.29, the fastest freshmen time this season for New Jersey and seventh for the Nation. 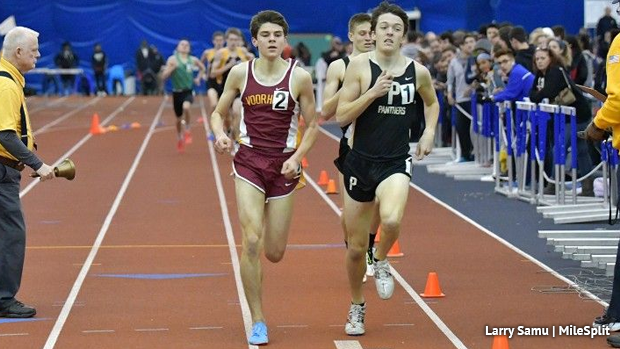 Drew Maher made sure there was no mistake as to who the dominate 1600m runner was in New Jersey this season. Winning all three titles of his state championship competition from Sectionals to the 4:11.83 victory at the Meet of Champions, Maher then placed fifth at New Balance Nationals Indoor with at hot time of 4:11.10 in the mile run. Chris Romero won the Group 2 Championship in a double duel with Devin Hart and was second at MOCs running 4:14.24. Romero closed his season eighth at NBNI running 4:13.66 in the mile. Francis Martingale came out the victor in an exciting Group 4 title race and was third at MOCs 4:15.14. Devin Hart's fantastic season finished with a career best 9:06.58 for sixth in the New Balance Nationals Indoor two mile. That performance converts to a 9:03.41 for the 1600m ranking US#5. Prior to that Hart amassed six straight 3200m wins including local county titles all the way through the Meet of Champions. The junior now has a Meet of Champions title in all three seasons having won last spring's 3200m and this past cross country championship. 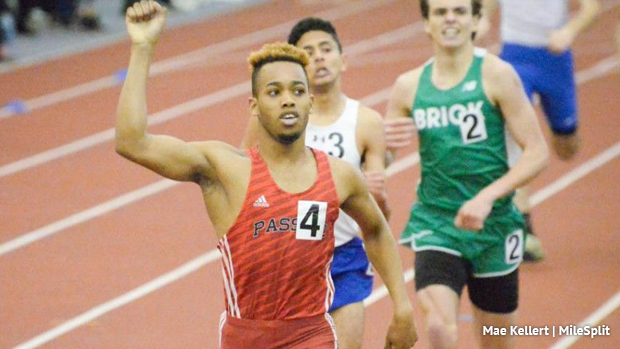 A'Nan Bridgett struck gold at the right moment this indoor, he improved his season best by four inches at the Meet of Champions to win a loaded field at 6-08. He was also 10th at New Balance Nationals clearing 6-07. Talking about Nationals Jadon Watson earned All-American status with his 6-10.75 bar for fifth. He also won Eastern States and was second at the Meet of Champions. Mark Anselmi was third at the Meet of Champions and just missed All-American status in eighth at NBNI. This was a great year for boys pole vault, for the first time since 2014 we had athletes over 15 feet and there were four over that height in 2018! Seth Kricheff of Old Tappan was the first to do so in January at Bergen County Relays and that seemingly broke the dam and inspired the rest of the state to up their game. Kricheff finished the season with a best of 15-0.25 and a third place finish at the Meet of Champions. 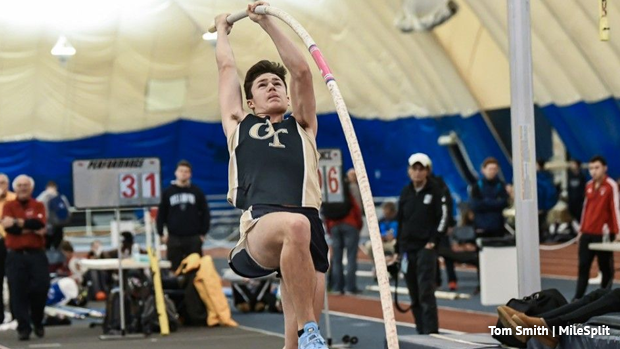 Another Old Tappan senior really took off the last month of the season clearing 15-0 five straight times, Tyler Hrbek won the Meet of Champions and was fourth in the Emerging Elite division at New Balance Nationals Indoor over 15-03.5. David Bausmith also cleared 15-03.5 at Nationals finished sixth in the EE and was second at MOCs. CJ Licata was the favorite coming into this season and pretty much didn't look back from start to end. His best of the season came in January at 64-05.5 US#8. He won 10 straight meets including the Meet of Champions and hit over 60 feet nine times, his season concluded with a 10th place finish at New Balance Nationals Indoor. 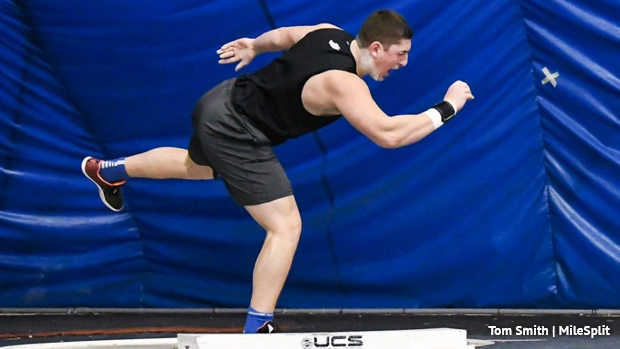 Kamron Kobolak of Cinnaminson won nine meets this winter, finished third at MOCs, and then earned All-American status at Nationals throwing a PR of 62-07.75 for fifth! Bill Goldsborough was second to Kobolak in Group 2 and then threw for second at the Meet of Champions. He won nine meets this past indoor including a sectional title and improved his PR to 58-08.75. East Orange Campus was the team to beat in a few relay events but shined in the 4x400m defending their Meet of Champions title for another season. They have a US#2 time of 3:16.60 and placed second at New Balance Nationals. Union Catholic and Christian Brothers Academy traded head to head wins this indoor, Union Catholic winning the Non-Public A state title and finishing fifth at Nationals. Hopewell Valley defended their Meet of Champions title with a meet record of 7:57.34. North Hunterdon gave them a run for it out of a slower heat placing second at 7:59.05, they went on to place 10th at Nationals with a time of 7:53.51. The Hopewell Valley squad went after the 4xMile at Nationals finishing second overall at 17:30.73.